Remember to clean the blade before sharpening. This blade got some remains of tape. That would prevent correct sharpening! Here is a Dianova sharpening device that i know much about from before. These last for years and it got 3 functions. It also got a hole so it can have a lanyard or rope for safety. It got two main sides with one coarse and one fine. They use mikron terminology with 60 and 30. The coarse side is 60 and the fine is 30. Usually it is always the fine surface that is used the most like I have explained before. On the picture is a never used one. As said I have used this before and I know them well. This is a high-end sharpening device for SAKs without any doubt. 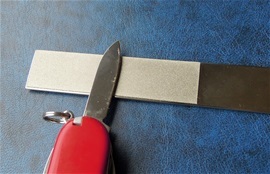 The slim side of the metal can be used as a sharpening steel to determine the situation of the edge. To see if it got damages and this is very smart to do. I always recommend that you look at the edge and the process during maintenance. Look on the edge before you do anything with it. The sharpening steel side can be used for exactly this. You can also use a magnifier of pocket microscope like I do. Maintenance is fun and it is giving! Enjoy it…..
For the 91mm SAKs this device is very helpful because you can use it on the little blade as well. The Dianova is not too small for the main blade either. It must not be any more narrow that said in my opinion. 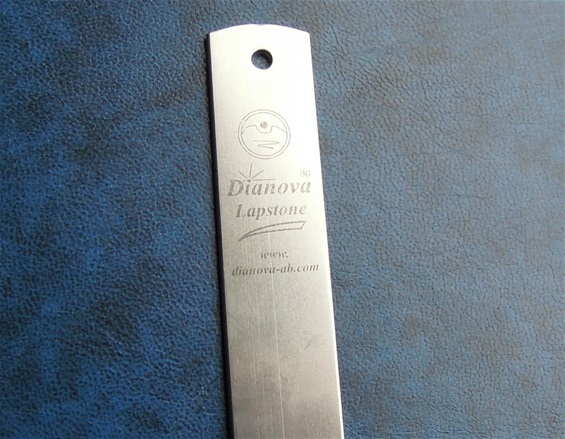 The Dianova is a diamond type sharpener that is used dry so you do not have to worry about oil or water. They are absolute best dry. From experience i have seen an incredible number of Swiss Army Knives. The strange thing many times when you look on used knives is the main blade that sometimes is so worn and damaged that I have to make a new edge on it, while the small blade is untouched and never used. Sharpening is the most important maintenance to do and must be regularly done. When blades are getting dull then more and more force must be applied for cutting. The results can be damages of the blade and on whatever is cut. The advantages with slim SAKs knife blades are that they can reach places other blades cannot. The edge can become very sharp with correct maintenance. The SAKs blades on the 91mm and less got delicate edges. If you use grinding wheels then I recommend using a fine stone. To use such a wheel if it does not have a clamped device then it can become a risk. It requires practice to use an electrical grinding wheel for delicate edges. With electrical wheel the stone should be a bit extra fine and with water. Sharpening by hand can become professional with practice and in time electrical wheel is not necessary unless you have to sharpening many blades. The amount of pressure you use on a SAK depends on a few factors so I recommend that you read all my pages to the left regarding this. To sharpen correct is not only about getting the correct angle and smooth edge. The amount of pressure you apply during sharpening influence the durability of this edge because during the process you can bend the metal from side to side with the result of a weakened edge. Seemingly it can look correct. On delicate edges you must only use light pressure and the advantages with a diamond coated sharpening device is that you can use even less pressure in the process. It is one of the reasons for why I recommend this a bit extra. I would like to mention both Victorinox and Wenger to be companies that made/make correct edges on the SAKs. The absolute best company I have ever seen that makes the perfect edges on knives is Helle. I have never seen any product that is sharper out of a box than them. Brusletto also makes an incredible sharp edge. When I run the tip of my finger nail along the edge it feels very smooth. On Helle it is so smooth that the only thing I could say is that it is something extra. This Company makes it very clear that traditional Scandinavian blades are cutters! This is an epitome of knives. It can be used on the table for the SAKs. I recommend using the main hand for the holding and moving of this sharpening device. The absolute best is cross motion back and forth. The advantages with this are several and because it is slim and lightweight it is easy to control. It is also very easy to see what you are doing because it is slim. Depending of the quality of the product you can expect some lasting longer than others. If you find a Brand with some extra quality then the advantages can be several. In my experience I have used cheap and more high-end types. The high-ends ones got a more even grit surface that is within the limit of the Micron or Grit number mentioned. They will also make sure the durability is longer. Usually all will be a bit different the first times you use them and by that I mean the complete 30 micron range will sometimes be present after a few times of use. In time when it is getting worn it will become a finer surface. 600 grit or 30 micron will be finer when diamond coated stones are getting worn. Therefor I always recommend not throwing away old worn diamond stones because you can use them to polish the edge. The amount of pressure you use during all sharpening will in my opinion influence the grit. Some may say that this is not possible because 600 grit is 600 grit. It is not so because the amount of pressure can yield another surface. The 600 grit surfaces can actually close to polish an edge when you use very light pressure. From experience the diamond coated stones are best after a few times of use and they will transform into a finer device in time.